Living Libations Chakra Synergies are offered in seven different blends. Root Chakra, Sacral Chakra, Navel Chakra, Heart Chakra, Throat Chakra, Third Eye Chakra and Crown Chakra. Chakra Synergie is a liquid jewel for harmonizing the chakras. Each elixir essence offers a gift to expand and glow with a halo of aromatic aura harmonizers. 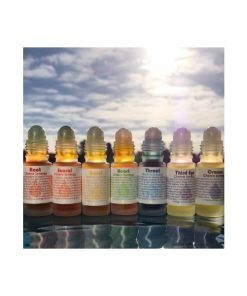 Anoint your chakras, pulse points, and under your nose for meditation and to harmonize energy centers, auric fields, and cruise your cerebrospinal muse. 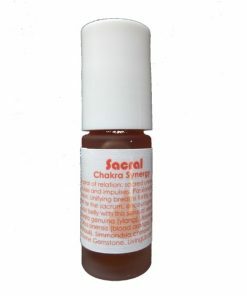 Size: comes in a 5ml roll on bottle with gemstone roller. Chakras are energetic spirals of energy in the body that coincide with glands. There are as many electrical currents in the river of your being as there are sparkles in a starry meadow. The breath keeps this river harmoniously flowing, distributing vital source energy through your entire body. Your susumna is the fluid sap soaring through the trunk of your tree of life. Along our spine’s scepter-stem are gems of rainbow orbs that cruise the cerebrospinal muse. The spine is the conduit for the journey of these electrical energies. Flexibility of the spine fuels the flow, and plant essences give liquid light to this journey. Light is the key to this portal land of chakra and energy flow. The soma of plants ever-offer the gift to expand our beauty: halos of essential oils inspire spiral streams revealing jeweled points of energy. The harmonizing of our chakras flows into the glow of our aura. The auric-field is a mirror of reflectance and acceptance, gleaming inner and outer worlds.